Eatlikeacow is proud to present...our new Food Films section! Anyway, let's start. For our very first Food on Film review, I thought I'd review the film "What's Cooking" by director Gurinder Chadha. An interesting look at multicultural Los Angeles, from the viewpoints of 4 families: The Avilas (Hispanic-American), Nguyens (Vietnamese-American), Williamses (African-American), and Seeligs (Jewish-American). As each families separately prepares for their own Thanksgiving feasts, they get to discover things that they don't know about their families. A sumptuous and uplifting drama involving an affair, a boyfriend, a lesbian couple, and a mysterious gun that is both heartwarming and witty. In time, these four families, each loaded with their own ordeals, will eventually cross paths and re-discover themselves. I especially love to see Mercedes Ruehl on a feature film - a gorgeous and talented actress. I've always loved the works of director Gurinder Chadha - for film buffs out there, who could forget her charming and brilliant works, "Bend it Like Beckham" and "Bhaji on the Beach". Chadha is an British-Indian director that often focuses on the theme of multiculturalism in her works - particularly on how people of different ethnicities fit into the western society. A theme that's eternally interesting to me, being a member of an ethnic minority myself. 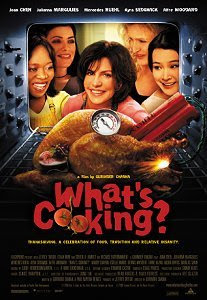 This film, "What's Cooking", is a seldom-mentioned gem of the cinema that satisfies both the heart and the tummy (as most good films that feature foods are). Recommended. Roast turkeys cooked in American fusion, Vietnamese, Mexican, and Jewish style; Vietnamese spring rolls; Mexican dumplings, tamales, Macaroni & Cheese, and all the traditional and not-so-traditional Thanksgiving fixings. And also, good ol' Kentucky Fried Chicken. (don't ask, just watch).